Here at Wineware, we specialise in everything to do with Wine, apart from Wine itself! So what better place to find the perfect wine related gift to give your loved ones this Christmas! You’ll find a gift for anyone, our extensive range of products is ideal both for the casual wine drinker who enjoys a glass but isn’t mad about it, the wine enthusiast who has (nearly!) everything, and anyone in between the two! Below we’ve listed a selection of different wine related ideas to give your lucky recipient this Christmas! There’s nothing wrong in pouring wine straight from the bottle into the glass, but are you really getting the most from the Wine and enjoying it to its fullest potential? If you ‘decant’ wine, you’re allowing the wine to breathe and aerate, which in turn releases the aromas and flavours that have been ’trapped’ and enclosed within the bottle. We supply a whole host of different Wine decanters from known glass manufactures and brands, the choice is nearly endless! The varied choice is due to a number of factors, the design and shape, the capacity or volume the decanter can hold and the manufacturing process, whether it’s made by hand or by machine. Choosing and drinking from the correct wine glass could be the difference in really enjoying a wine to not being impressed at all! Using the correct glassware, you’d be surprised how the shape and size of the glass will improve the overall taste and flavour of a wine. Our vast range of different glassware covers red and white wine in general, but certain glass manufactures have gone that step further and categorised glasses to specific grapes or wine regions. 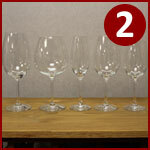 For example, the popular Riedel Vinum range has 6 different glasses for red wine, all of which have been designed to work perfectly with certain grapes of wine regions, Bordeaux, Burgundy etc. Likewise with our Wine Decanters, glassware can range in price due to quality of the glass and how it’s been made and the amount of glasses within the set. Wine aerators, funnels and pourers are a great way enhance and quicken up the wine aeration process. These little gadgets will save you from decanting your wine hours before drinking (if you can’t be bothered or totally forgot! 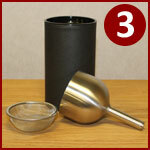 ), as it replicates the process allows your wine to breathe. We stock a varied range of different pourers and aerators, some which you attach to the end of the bottle, some your pour your wine into and even an aerating wine decanter! Storing wine in the correct conditions and surroundings is vital to enjoying the wine, it can be as important as the glass you’re drinking out. It’s important that the cork is kept wet before it’s been opened, otherwise if it dries out, it could start to crumble and in turn ‘cork’ the wine making it un-drinkable. The Modularack wine rack system is great as when wine is stored, the bottle is tilted slightly towards the neck, keeping the vital wet at all times. Not only that, it’s visually excellent, easy to assemble (no tools or screws required) and you don’t have to hide your collection in the cupboard, you can show it off! 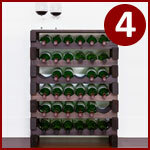 They’re available in a variety of different bottle capacities and are supplied either in natural pine or a dark stain. They really great thing about the Modularack system, is that it can grow at the same speed as your wine collection as you’re able to add more layers on top of your existing wine rack! Corkscrews and bottle openers are available in all sorts of different shapes and sizes, from easy to use lever models to the traditional waiter’s friend style. The waiter’s friend style bottle opener is commonly used in restaurants and bars where the waiter / sommelier opens your chosen wine at your dining table. If you’re looking for an easy to use waiter’s friend corkscrew, opt for Wineware’s very own double lever opener, it’s finished in rosewood and is presented in a gift box! 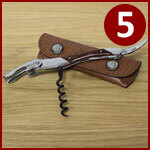 Alternatively, if you’re looking for something extra special, why not treat them to a hand crafted Laguioule corkscrew. 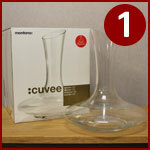 Hopefully Wineware’s Top 5 Ideal Wine Gifts has provided you with some great inspiration for Christmas gifts! Alternatively, click here to view our gifts section, where you can find some great stocking fillers, presents that are ideal for him and for her too! If you’re still stuck and can’t decide, then why not give a Wineware Gift Voucher, and let them decide!